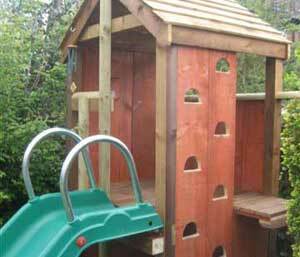 I was asked to design and build a playtower by a customer at a more reasonable price than those produced commercially. I produced the one shown for around half the price of those featured in various glossy brochures! I enjoyed the project and would be happy to design and build more. Instead of a ladder, I cut semi circular hand and foot holds as a way to the platform. 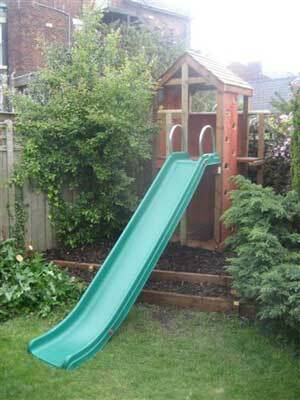 All the wood is weatherproofed and surfaces are smooth and child friendly. My client said "My children spend as much time as they can playing in the tower. It has been a great success and I am very, very pleased with the result.